I took the most common combinations of work that people needed, packaged them together, and discounted them heavily. I put in a few regulations on the deals to make sure they wouldn’t reduce my profitability, but I realized that if all I did was sell 3 of the larger packages (which is 40% off a la carte), I’d easily earn well over six figures per year—my dream come true at the time—and not have to worry about booking 6-10 different small projects per month just to make my minimum income goals. Plus, because of my process, they’d take me less time to do than any of my other typical projects—meaning that even though they’re “heavily discounted”, I’d still be making more money in less time. And wouldn’t you know, once I published those two new package deals on my website, they were the #1 products people were inquiring for. Because from their side, they were total no-brainers. Like I mentioned above, I was kind of frustrated when clients—even those ready and willing to spend money on my premium services—were still stuck in their budget, money-saving mindsets to the point that they’d always be trying to make sure they saved some money somewhere. I’d tried educating a few clients to show them the ROI, but that never really worked as well as I wanted it to, so I knew I needed a new approach. I couldn’t quite figure it out, when one day, the term “Power Trip” crossed my radar. Each of them represented what most of my clients typically needed done with their business messaging, but at a discounted rate. I discounted it because instead of coming up with page or ad structure from scratch, I’d just be replacing the text that already existed in its current design. It’s easier for me and easier for the client—if they don’t want to deal with a brand new re-design, all they’ve got to do is copy and paste the text I send over to them. I do have to say though, that these deals were only possible because I’d already set pretty high prices on my a la carte items. If you don’t already have high enough a la carte prices, consider raising them. Like I mentioned above, I wanted to make sure these package deals were somehow easier for me too—so as not to just kiss 40% of my profits away for the sake of giving someone a deal. If I’d be spending the same amount of time and effort, I knew these packages wouldn’t be sustainable. Sure, I wanted to do my best work and give my customers what they truly needed for their brand messaging, but at the same time, I didn’t want to actively make myself less profitable per hour in the spirit of idealism. So I had to find a way to make these deals easier for me to deliver than when someone ordered an a la carte item. So for both packages, I decided that I’d only offer them as re-writes to pre-written pages and layouts. I usually give small bits of design input and build in time to talk with the client’s web designer into my projects. But by only doing re-writes, I don’t even have to think about this. Plus, most of the time, the pages are a lot shorter than the ones I’d produce. And for the smaller package deal, I decided to shorten the entry questionnaire exercise I take all of my clients through. Since the smaller packages is a rewrite of only three pages, I knew I could identify just the questions I needed for those three pages and we wouldn’t have to bother with the rest. I’d still be able to do my best work with that shorter version, so it’s another win-win scenario. When I published the package deals on my Hire Me page, I put them front and center. Underneath, I’ve got my a la carte offerings at their normal, list prices. So by anchoring my prospects with the idea of buying one of these package deals—especially when they do the math of what they’d pay for the pieces they’d want otherwise—they seem like total no-brainers. Even if they’re slightly more expensive than what they’d spend otherwise, it’s usually such a good deal in comparison that they can’t say no to it. 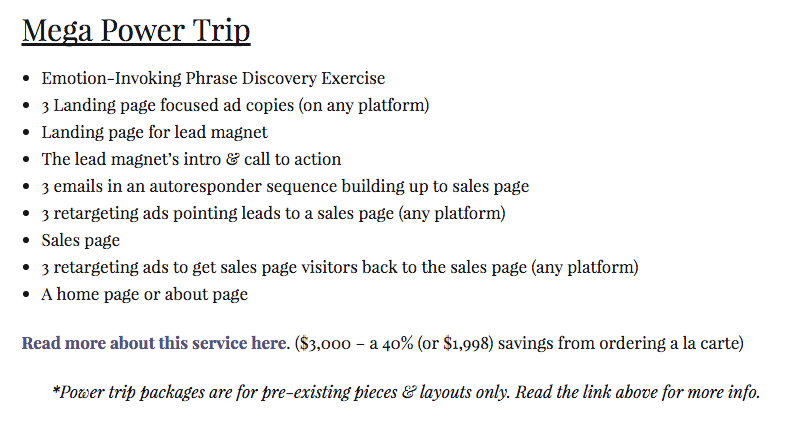 In fact, the only reason someone doesn’t book one of those packages now is if they’re starting a business and just don’t have their pages written already… or if they know they need a new sales page from scratch. I’m booking more and more of these projects and happily bringing in more profits. And my clients are happily saving money on copywriting, saving time/money on their page design, and still getting the incredible, premium messaging they came for. Everyone wins in so many ways. Finding the win-win-win scenarios for yourself isn’t always an obvious answer. They way I did it was to identify what my customers really needed, how I could make that offer irresistible for them, and then asked how I could make it worthwhile for me as the freelancer. Try that and see what ideas you come up with. Chelsea Baldwin is the founder of Copy Power, where she teaches writers and marketers to create better on-page copy using reverse-engineered buyer psychology. Her free ebook shows five best on-page copy modifications to reduce bounce rates and increase conversions.